Janine DeVito’s 157-pound weight loss inspired her mom to drop 105 pounds. In June 2002, I took a cruise to theBahamaswith my daughters, Janine and Chris. I was 240 pounds, and my daughters were also extremely overweight. It’s embarrassing how much we ate on the ship. We must have picked up either a hot dog or some soft ice cream (or both!) every time we passed the snack bar. At night we sat down to five-course meals, and then ate again at midnight. On returning, I was mortified–though not surprised–to find that my weight had jumped 19 pounds in 7 days. A few weeks after we came home, Janine got more serious about dieting than I’d ever seen her. She was turning 30 and afraid that she would never meet “the” guy. With the help of a health-conscious friend, she began to document the fat, carbs, protein, and calories in every morsel she consumed. I watched her read labels and asked, “What are you doing?” I’d never turned over a box in my life! Janine tried to persuade her sister and me to give it a try. She’d make us a dinner–baked chicken and steamed broccoli. But we weren’t ready. I’d throw it out so she’d think we’d eaten it. 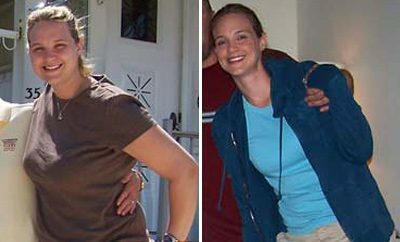 Still, watching her lose 60 pounds in 6 months wasn’t easy to ignore. After all, I was killing myself: I had high blood pressure, high cholesterol, acid reflux, and heart palpitations. Every night, I went to bed scared that I might not wake up. 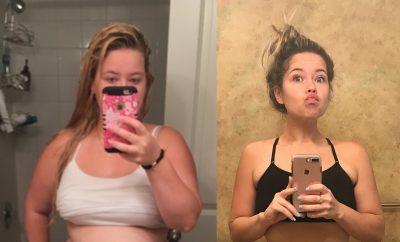 Three months later, when Janine had lost 100 pounds, I realized that, at 240 pounds, I had to give my daughter’s diet a try. Janine ran over with a chart listing the calories, carbs, protein, and fat in every food that she thought I’d eat–fruits, fish, meats, vegetables, even condiments. Then she went through my kitchen: “Mom, you can’t have this butter around,” she’d say. She portioned out all my food, which made it easy for me to unload 22 pounds in the first 4 weeks. But I’m Italian-Irish. 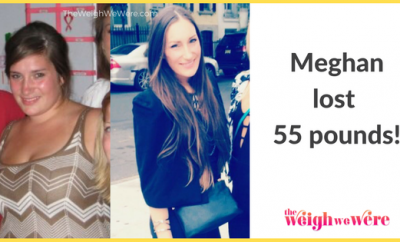 I knew I couldn’t live happily without ever eating pasta or having another drink–both off-limits on Janine’s diet–and I wasn’t about to count and measure forever. I thought, I can do this my way. I didn’t need a chart to know what had made me fat. My problem wasn’t lunch and dinner. It was the entire cheesecake I’d devour in the grocery store parking lot. After a month or so of playing by Janine’s rules, I was ready to stop documenting and just use common sense. I’d eat my egg-white omelette in the morning, but at night, I’d let myself have steak and a cocktail if I wanted one. I still made my lasagna and my chicken cutlets, too. I’d eat a small piece and freeze the rest. The only things I banned completely were sweets and fast food. Janine had also begun an intense exercise regimen at our local gym, and she encouraged me to join her. With torn cartilage in my knee and shoulder, I knew the gym wasn’t for me. But adding more movement to my life seemed like a good compromise. I started at work. I’m an assistant to the executive producer at As the World Turns inNew York City, and when my boss wanted something from the set, instead of sending an intern, I walked the three flights to grab it myself. At home–now that I was lighter–I found myself heading down to my basement five times a night. In the old days, I doubt I saw those stairs once a month! Once I’d lost 40 pounds (and had stopped gasping like it was my last breath), I found walking to the bank easier than trying to park in the city. By August, 17 months after I started, I’d lost 98 pounds. Even the soap opera stars have been asking me for diet advice! I tell them that I look at each day as another chance to practice eating right. The truth is, it’s still not easy. People say your stomach shrinks. Well, mine didn’t. Quite often I’m hungry when I leave the dinner table. After an hour or so of watching TV, I’m very tempted to scarf down a bag of chips. But I think about all the beautiful new clothes in my closet and grab some grapes instead. The best part about losing weight has been sharing my success with Janine. A year ago, she surprised me with tickets toHawaii(I hadn’t been on a plane in 30 years for fear I’d have a midair stroke). Skipping through the ocean in a sundress made me feel like the skinny teenager I’d never been. Even more thrilling was attending the Emmys in a size-8, full-length, sequined dress I’d bought years before. Never in my wildest dreams did I think I’d actually fit into it! Since that gluttonous cruise, Janine and I have lost more than 250 pounds together, and her sister, Chris, has started to lose as well. Sure, we may gain a pound or two like everybody else. The difference now is that instead of letting a 5-pound weight gain give me permission to throw in the towel and dive face-first into jelly doughnuts, I–make that we–now have the courage to take back control the very next day.